Remember all the way back in January, when spring sunshine seemed like a million years away, when I shared my DIY tasseled curtain project? 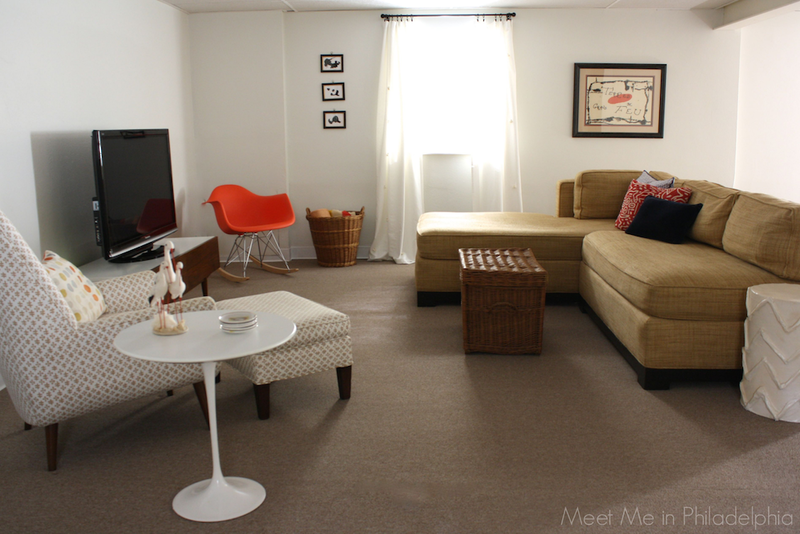 At the time, I planned to share a sneak peek of the changes we'd started to make to our finished basement...but the sub-zero temperatures kept me from the space entirely. Now that the weather's more cooperative, I snapped a few pics of the basement that I wanted to finally share! If most of the furniture down here looks familiar that's because it is! The sofa, chair and ottoman, Saarinen table and tv stand all previously lived in the living room & bedroom of our former apartment, while the DIY papier mache side tables lived in the den area of our former apartment. 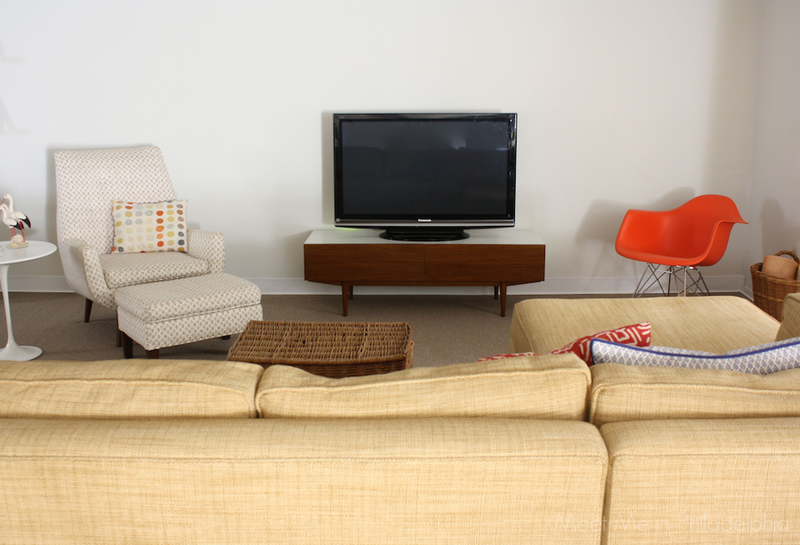 Our style has evolved in the main living areas of our house, but we loved our older pieces too much to get rid of them. 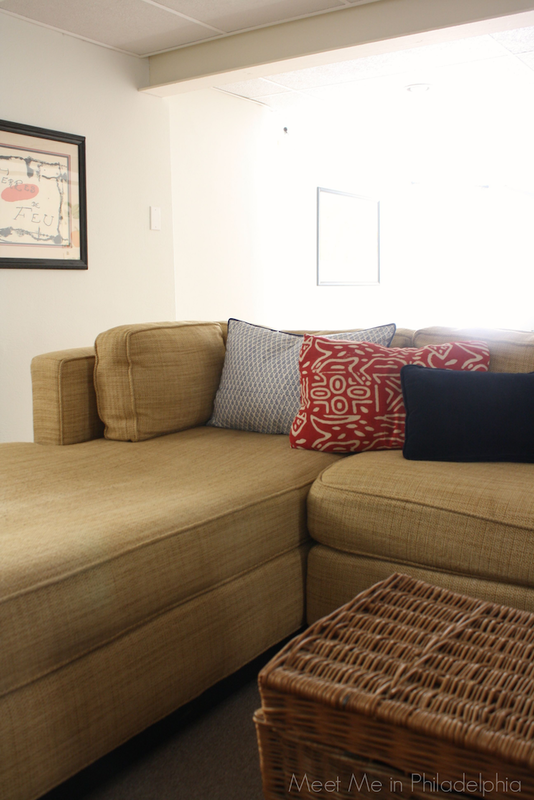 It works perfectly that our finished basement proved to be the perfect casual space for this furniture. We intend to use this seating area as a place for Adam to enjoy his decades-worth of video games. His various games and game consoles will live down here (efficiently hidden), giving him his own "man cave" of sorts...though we'd never call it that. Our MGBW sofa, which we love to death and couldn't bear to part with, partitions what would otherwise be a large open space here in the basement. 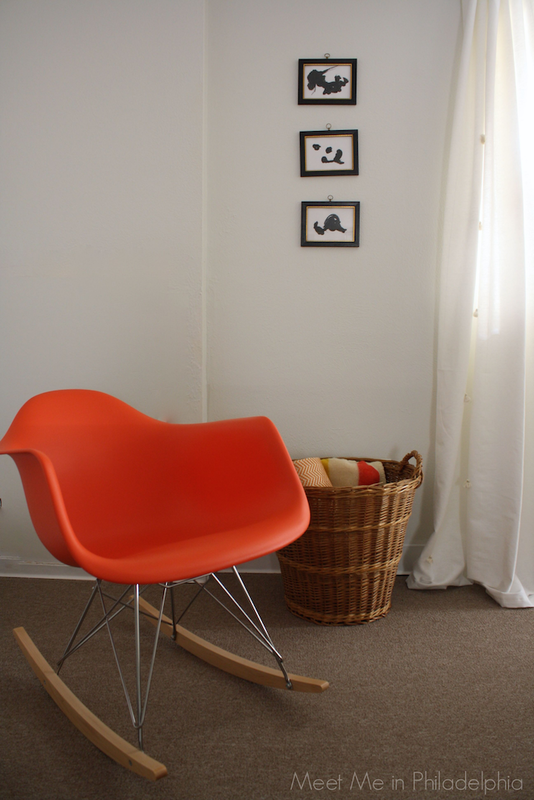 Setting up the furniture the way we have gives definition and purpose to this corner. And since most of the decorating decisions in our house are about my whims and wishes, I wanted to make sure Adam had a space for his "things". Aside from video games, Adam loves records. He has been carefully building his vinyl collection over the last year. 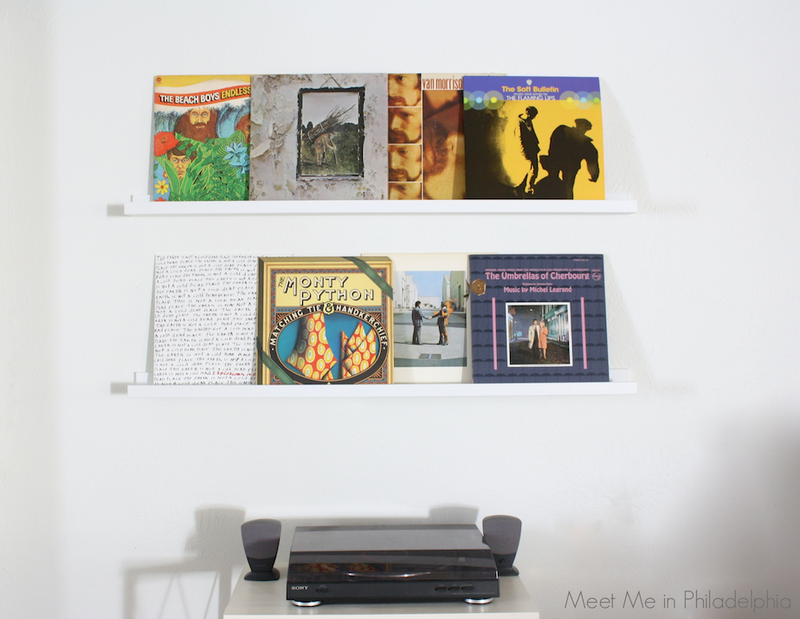 I wanted to honor that interest, so together we made a little area for his record player and a wall display for some of his favorite albums (most of which aren't shown...there are many more!). Two of the 45" Ribba picture ledges from Ikea work beautifully for showing off a rotating collection of album artwork above the record player and speakers. There you have it, a long-overdue sneak peek of our finished basement changes. When I say sneak peek, I mean exactly that; in fact, there are a few more areas we've begun to furnish and customize for the way we want to live in this space. Be on the look out for more updates soon! You have such a beautifully bright basement, it looks great. And by picking such great pieces from the start, even your 'castoffs' look like a million bucks. Well done sister. Ha, it's funny because the space actually isn't really that bright. A long-exposure time and a DSLR-on-a-tripod work miracles in low-light spaces. This is an amazing space, Ashley! And like Elizabeth said even your "castoffs" are first-rate. Love it! This looks great and I love the display of the vinyl collection - I bet Adam thinks that's pretty cool too. It does not look at all like a basement. Thank you! "Basement" really is an ugly word, huh? Nice job. I like the texture the baskets bring. Thank you! Both baskets were thrifting finds, if you can believe it! Love it, love it, love it! It's all soo good. 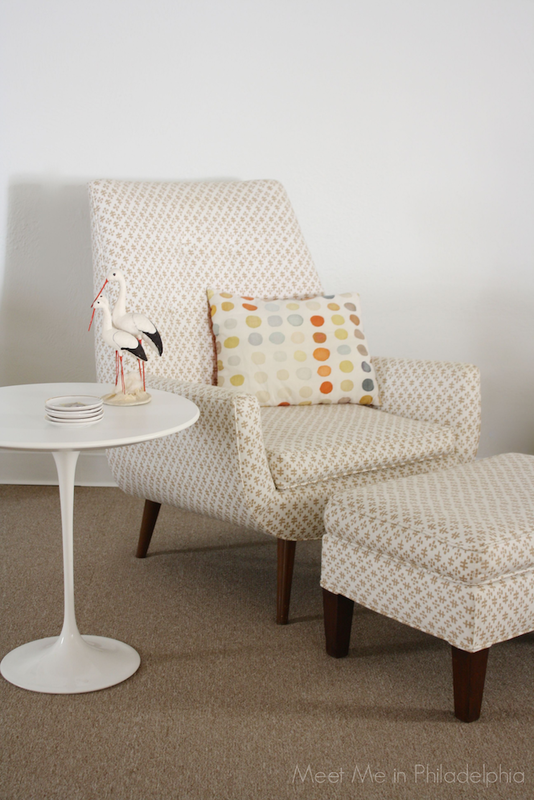 Love that mid century modern chair covered in sister parish? fabric. Nice work! Such pretty pillows too! I bet you had something to do with that. And tell Adam I have about eleventy million albums I can add to his collection. My husband collects as well! And I've trumped "man cave" for "lounge" in these parts. Wretched phrase! That’s surely the kind of basement you wouldn’t mind living in. It’s so spacious and well-furnished, that it could almost pass as a main living room. You certainly did a great job in transforming this space. Cheers to your building and organizing skills!